(CNN) -- Authorities said they were searching the Taj Mahal hotel in Mumbai, India, on Saturday morning after killing several militants, and other standoffs across the city appeared to have ended by Friday. An Indian police officer takes position during an operation at the Chabad House Jewish center Friday. Officials said that at least 160 people have been killed in the violence and more than 300 injured. • As police rushed to the scene of the attacks, gunmen attacked the Cama Hospital for women and infants. Several people were killed at the hospital, and a standoff there lasted until Thursday morning. • Two other groups attacked the Oberoi and Taj Mahal hotels, taking hostages there, police said. Australia: Department of Foreign Affairs offers these numbers: In Australia, call 1-800-002 214. Australians overseas, call 61 2 6261-3305. UK: The British Ministry of Foreign Affairs is directing concerned UK nationals to call 44 (0)20 7008-0000. For Canadians in India, call 1-800-387-3124. In Canada, call 613-996-8885. • Gunmen took hostages at the Chabad House, where several Jewish families live, police said. • Police said gunmen fired indiscriminately from the Chabad House. Stray bullets killed a couple in their home and a 16-year-old boy who stepped outside, police said. • The Chabad-Lubavitch International group said Rabbi Gavriel Noach Holtzberg, 29, made a phone call to the Israeli Consulate to report gunmen in the house. "In the middle of the conversation, the line went dead," the organization said. • Authorities raided the Chabad house Friday morning. Two gunmen died after the assault was launched, CNN-IBN reported. Authorities said five hostages -- including Holtzberg, who was an American, and his Israeli wife, Rivka, 28 -- were found dead. One of the three others was a second American rabbi, New York Mayor Michael Bloomberg's office said. • At the hotels, hostages or people who were trapped exited at various times Thursday and Friday. Commandos entered both hotels, trying to flush out militants and rescue others. • Fire brigades battled blazes at both hotels. By early Friday, it appeared that what had been a major fire at the Oberoi had been extinguished. • Police were reporting Friday that the standoff at the Oberoi was over. Two gunmen were killed as authorities cleared the hotel, said J.K. Dutt, the National Security Guard's director-general. Thirty-six people were found dead there, according to Bhushan Gagrani, a Maharashtra state official. • At various times Saturday morning, gunfire and explosions could be heard as security forces worked to clear the Taj of at least one remaining gunman. • Shortly before 9 a.m. Saturday local time, Dutt said that three militants had been killed but that security personnel still needed to search the hotel for civilians and any possible remaining gunmen. His comments came shortly after Mumbai Police Chief Hussain Gafoor told CNN-IBN that the last militants at the Taj had been killed. The statements coincided with an apparent end of gunfire at the hotel. • By Friday night, 160 had been killed in the Mumbai attacks, including at least 15 foreign nationals, authorities said. These included five Americans, three Germans, an Italian, an Australian and one Chinese. • The official death toll did not include attackers who were killed by security forces. R.R. Patel, the Maharashtra home minister, said Friday that nine attackers had been killed. • More than 300 people were wounded, including seven Britons, three Americans and two Australians. • Two of the killed Americans were identified as Alan Scherr, 58, and his daughter Naomi, 13, both of Virginia. The two, who were visiting India with a meditation group, died at the Oberoi. • Also among the dead were 16 police officers, two commandos and the chief of the Mumbai police anti-terror squad. 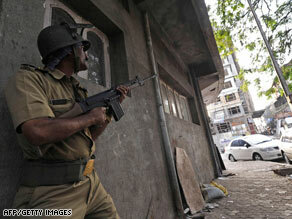 • CNN-IBN quoted police sources as saying there were about 26 gunmen. • Authorities found 8 kilograms (17 pounds) of RDX, one of the most powerful kinds of military explosives, at a restaurant near the Taj. • The Indian navy, stepping up patrols on the country's western coast after the attack, was questioning the crew of the MV Alpha, a ship detained with the help of the Indian coast guard, British authorities said. The authorities said that they think the attackers' boats came from this ship and that they think the ship is from Karachi, Pakistan. • Several Indian news outlets reported that a group called the Deccan Mujahideen e-mailed them to claim responsibility for the attacks. Intelligence officials say little is known about the group. U.S. officials and security analysts say the sophistication of the attacks may indicate that a more-established group is involved. • State media Press Trust of India, citing Union Cabinet Minister Kapil Sibal, reported the gunmen had worked for months to prepare, even setting up "control rooms" in the two luxury hotels that were targeted.